Look at what he bought for me today! A Juki TL98Q Professional. Wowza...I can't wait for it to get here! I guess while I am being cranky, the same goes to the LQS in town that will not lower themselves to talk to me when I come in the store. No Bernina for me. It's sad, isn't it, Chris? I am grateful that there is another LQS where I am treated like family and they are glad to see me walk in the door. You are going to love it. 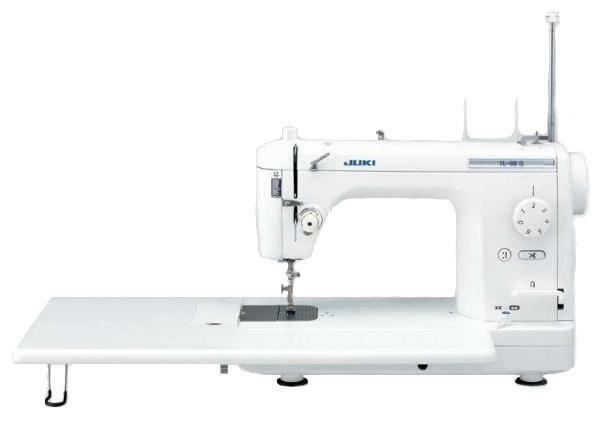 I have a Bernina 220 that I use for piecing but for machine quilting I prefer my Jukie. @ Lisa - Thanks! I am so excited to get it and try it out! @ Barbara - I call myself a beginning quilter and I bought one. :-D Take that for what it's worth. I've been sewing/quilting for just over a year. My Viking Platinum 770 has a lot of bells and whistles and I love it, but lately I wanted a machine that did one thing and one thing only...A beautiful straight stitch. This one meets the desire, along with a larger work area to quilt larger quilts. I am thrilled for you! What a great hubby you have. Congratulations on the new machine and your anniversary! I've heard great things about that Juki... plus it looks SO cool!